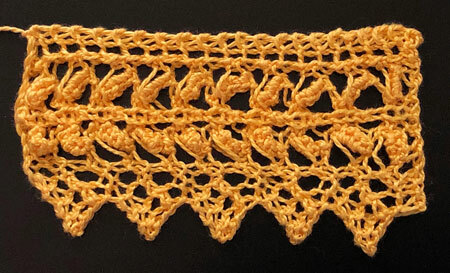 This pattern has been updated into modern knitting language, charted and tested for errors. 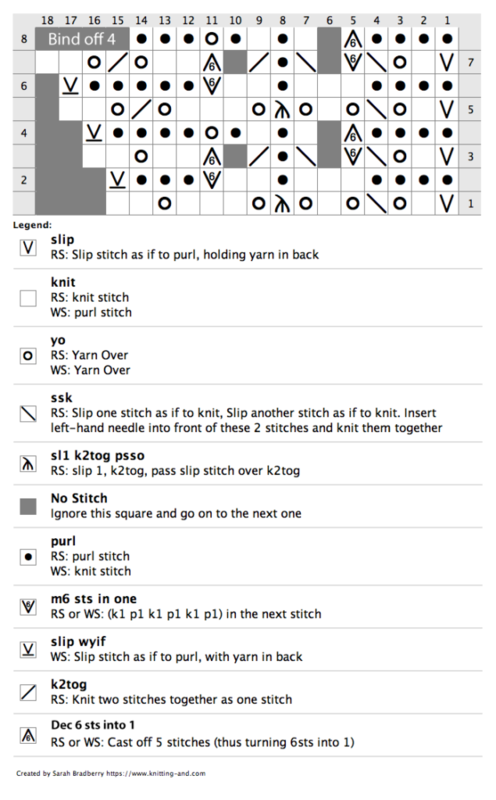 1-to-6 inc: work (k1, p1) three times into the next stitch. BO 5: Bind off 5 stitches. Row 1 (WS): Sl, k1, yo, ssk, yo, k1, yo, sl1-k2tog-psso, yo, k3, yo, k2 (15 sts). Row 2: Sl1, k3, 1-to-6 inc, p2, k1, p3, k4 (20 sts). Row 3: Sl1, k1, yo, ssk, 1-to-6 inc, ssk, p1, k2tog, BO 5 sts, k2, yo, k2 (19 sts). Row 4: Sl1, k4, yo, [k1, p1] twice, BO 5 sts, k4 (15 sts). Row 5: Sl1, k1, yo, ssk, yo, k1, yo, sl1-k2tog-psso, yo, k3, yo, k2tog, yo, k2 (17 sts). Row 6: Sl1, k5, 1-to-6 inc, p2, k1, p3, k4 (22 sts). Row 7: Sl1, k1, yo, ssk, 1-to-6 inc, ssk, p1, k2tog, BO 5 sts, k2, yo, k2tog, yo, k2 (21 sts). Row 8: BO 4 sts, k2, yo, [k1, p1] twice, BO 5 sts, k4 (13 sts). Rows 1 to 8 form the pattern. Repeat for the desired length. Cast on 13 sts and knit one row. Commence from row 1 of chart.